The 36″ Pond Lily Chandelier is the largest reproduction Tiffany Studios lamp we create. With its generous size and strong horizontal lines, this shade transports the viewer to the edge of a quiet pond in summer. 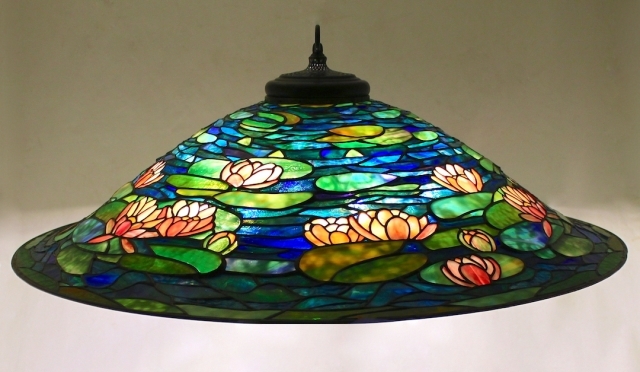 Water lilies in varying shades of white, pink, and yellow dot the sparkling blue surface of this unusually shaped shade. The water glass is a mix of mottled, streaky and gently rippled glasses. 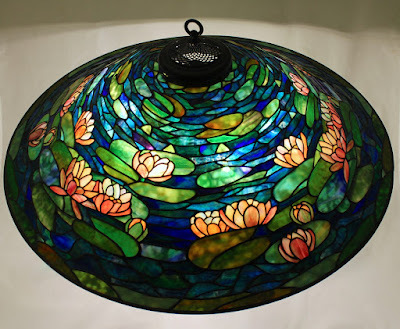 Tiffany Studios designed this lamp to be a large chandelier fixture. This shade was created as a showroom piece in 2016 and is now in a private collection.